The Island caught up with the man who was nicknamed Mr. Cricket for his deep knowledge about the game. In this interview, Hussey opens up on his battles against Murali, his close relationship with the man who was once his opponent and later a team-mate. Dismissing Kumar Sangakkara in a Test match and the future of Australian cricket and lots more. Here are the excerpts. The Island: Your average against Sri Lanka which stands at 110.44 is significantly higher than that of your career average – 51:52, what helped you to fare better against the Sri Lankans? Hussey: Probably luck. I am not sure. It’s strange how it works out. It seems that there is one particular team that you have some luck going always. I have no answer, honestly. You try your best in every series you play and something must have gone right for me every time I played Sri Lanka. The Island: A lot of players struggled picking Murali. Did you pick him? Hussey: I struggled picking Murali too. I was lucky to play Murali in Test matches in Australian conditions where there was not much help for him. I never got to play him in Test matches in Sri Lanka. I found him very difficult to play. He in fact is among the two hardest bowlers I have faced. Dale Steyn being the other. The Island: You and Murali are great mates? Hussey: I love Murali. In fact Murali should be Mr. Cricket. He knows just everything about the game. 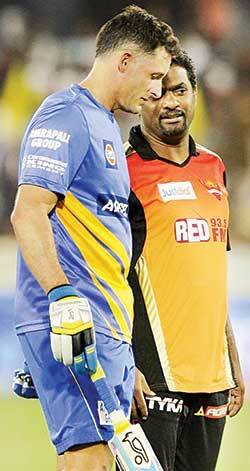 We were team mates at Chennai Super Kings in the IPL. I tried to learn as much as possible from him. Deliberately I used to sit next to him on the plane and in the dressing room – every minute, every day. He obviously loves talking about cricket and I love to listen. We have got on really well and we still get on well. I love his company and he is a legend. The Island: You made your debut at the age of 30. You were scoring heavily both in Sheffield Shield and County Cricket without being called up to the Australian side for a long time. How do you keep persevering when all hope looks lost. Hussey: I love the game. I wanted to play positive for whoever I was playing for. Just hoping one day the opportunity might come up. I probably gave up at one stage. I thought I had missed the bus. But thankfully I got the opportunity and once you get a chance – the bonus was I knew my game – and I knew what I had to do to have success. Certainly after taking so long to make it, I was not going to take anything for granted. I made sure that every game was like going to be my last. The Island: The mental adjustment you had to make from being a top order batsman to middle order batsman? Hussey: I didn’t make too many technical adjustments. Mentally, I had to be aware of different situations of the game. I thoroughly enjoyed batting in the middle. You come in during different situations and you try to play accordingly. You might come in when the team is in trouble at 20 for three and something like that. Or you might come in when the team is 300 for three and you need quick runs for the declaration. Or you get a chance to play with the tail. In sub-continent you have to play lot of spin or reverse swing comes into the equation early. I enjoyed the different challenges of playing in the middle order. The Island: Do you feel that you played in the wrong era where there were too many established stars? Hussey: Yes and no. I would have loved to get an opportunity to play much at a younger age than I eventually did. But I also feel that I was very fortunate to play with some of the greatest guys to ever play the game. To play alongside guys like Shane Warne, Glenn McGrath, Ricky Ponting, Matthew Hayden, Adam Gilchrist and Justin Langer. I feel lucky to be along with guys on the field and observe from a close range how they went about things. The Island: You were in charge of the team song during your playing days. What are the characteristics people look for in giving someone that responsibility. Hussey: The decision is made by the incumbent who leads the team song. So Justin Langer led the team song. When he retired he had to pass it onto someone whom he thought was the most fitting person. So he passed it onto me. I am not sure what exactly he saw in me. I just wanted to be a good team man and do whatever was required by the team. It was a great honour. I couldn’t believe that he passed it onto me. I wanted to make every Test match win special for everyone. The Island: What are characteristics you saw in Nathan Lyon when you passed it onto him. Hussey: I saw a great character. I saw someone who played the game for the right reasons. Not for fame or fortune. He works hard at the game. He has respect for the game and respect for the past players and the history and traditions of the game. He came from humble beginnings himself. I wanted him to pass on those attributes to the next generation. That was why I chose him. The Island: In the Hobart game in 2007, you made 132 and in the same game Kumar Sangakkara made 192, the highest score by a Sri Lankan in Australia. Hussey: Sanga was not out and it was a lucky dismissal for us. He batted magnificently. He is an unbelievable player and we were lucky to get him out. The Island: You have a handful of Test wickets and among them is K.C. Sangakkara, world’s number one ranked batsman at that point. Hussey: That’s my number one. My biggest wicket. I guess, I deceived him with a bit of lack of pace. He was just early on his shot and I couldn’t believe that I had dismissed someone like that. I don’t think I got him out. It’s more to do with him getting himself out. The Island: Remember who took the catch. Hussey: Phil Hughes and it was at the slips. Unfortunately he is not with us anymore. He was a young lad who broke into the team. He was a cheeky character. We loved him. He wasn’t the most conventional player. He was unorthodox but had a knack to score runs. That’s why we loved him. Plus his cheeky character and his cheeky nature was a lot of fun. The Island: On that tour, the 95 you made in Galle was on a tough wicket. That wicket was rated ‘poor’ by the ICC Match Referee. Is that the toughest wicket you have played on? Hussey: I am going to say yes. It was an important toss to win and glad we won that. Felt like we were batting on a beach. There was so much powder and sand quite a lot and the ball was turning square. Not consistent as well. Some would turn, some would not. Obviously needed some luck as well. I was really disappointing to get dismissed for 95, I badly wanted to get a hundred. Conditions were so tough and we knew that if we got a decent first innings score it would be tough to beat us. It turned out to be that way. It was a famous Test match win for us. Thankfully we got over the line. The Island: Mahela got a hundred as well in that game. Hussey: He is such a smart player. The tougher the conditions the smarter the players will come to the fore. The way he manipulates the field, the way he makes the bowler to bowl in his areas and stuff. He is a quality player and I am sure it would have meant a lot for him as well. The Island: Thisara Perera is called Panda. There’s this belief that some of the Australians in the Chennai Super Kings team coined the word Panda. Is that you? Hussey: I don’t think so. It wasn’t me. But I remember calling him that. I don’t know where it came from. The Island: In just seven years of Test cricket you have achieved quite a lot. Hussey: I felt I had a long career. Seven years in Test cricket is a long time. I just loved every minute of it. I loved the World Cups, the Ashes and then doing well in challenging conditions like Sri Lanka, India and South Africa. It was a great team and great guys and I enjoyed it. The Island: Aussies seem to be struggling in recent times. Hussey: It has been a tumultuous period for Australian cricket. It really has been. It is tough. If you take out your best two players the teams will struggle. If you take out Kane Williamson and Ross Taylor they are going to struggle too. Sri Lanka found it as well. You take Sanga and Mahela out and they have struggled. That’s the way the game goes. Hopefully they will come back into the team. There are some good young players who have been exposed against good attacks. That will stand in good stead for the future. They would learn a lot from what they have gone through. Humbling experience for lot of them to be brought down to earth. You have to realize that you play hard but fair. I am sure the team would have learned a lot in the last few months. Lovely interview with Michael Hussey…..
Much of his character is revealed in his answers to the questions — above all his modesty.